We’d love your help. Let us know what’s wrong with this preview of The Bohemian Grove by Mark Dice. The secretive and strange Bohemian Grove is an elite men’s club hidden deep within a 2700-acre redwood forest in Northern California, where each July the most powerful men in the world gather for what’s called their annual Summer Encampment. Is this mysterious meeting “just a vacation spot” for the wealthy and well-connected, or is it something more? Does it operate as an The secretive and strange Bohemian Grove is an elite men’s club hidden deep within a 2700-acre redwood forest in Northern California, where each July the most powerful men in the world gather for what’s called their annual Summer Encampment. Is this mysterious meeting “just a vacation spot” for the wealthy and well-connected, or is it something more? Does it operate as an off the record consensus building organization for the elite establishment? What major plans or political policies were given birth by the club? Do they really kickoff their gathering each year with a human sacrifice ritual? Is this the infamous Illuminati? After getting his hands on some rare copies of the club’s yearbooks; obtaining an actual official membership list smuggled out by an employee; and having personally been blocked from entering the club by police—secret society expert Mark Dice uncovers The Bohemian Grove: Facts & Fiction. To ask other readers questions about The Bohemian Grove, please sign up. I am fascinated by conspiracy theories. In fact, I probably knew more about Bohemian Grove than most readers starting this book (which isn't all that much), and I learned quite a bit more about it, but it was the style that bugged me. For instance, Dice would say something along the lines of "if the participants conducted a mock human sacrifice, it's not hard to imagine them actually sacrificing humans." Wait, what? Even if it isn't "hard to imagine" it, it doesn't mean they are doing it. Don't I am fascinated by conspiracy theories. 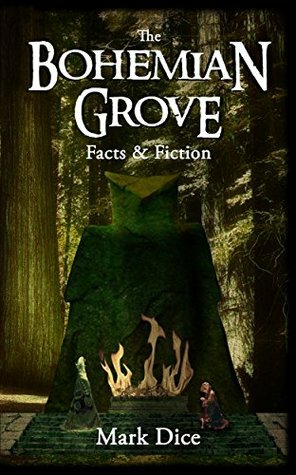 In fact, I probably knew more about Bohemian Grove than most readers starting this book (which isn't all that much), and I learned quite a bit more about it, but it was the style that bugged me. For instance, Dice would say something along the lines of "if the participants conducted a mock human sacrifice, it's not hard to imagine them actually sacrificing humans." Wait, what? Even if it isn't "hard to imagine" it, it doesn't mean they are doing it. Don't get me wrong, it seems like there is some pretty nefarious stuff going on there, but it is irresponsible to project conjecture and guide the reader to think your conjecture fact. Especially if you're a guy that previously, and not that long ago, wrote a book about Fake News. Mark Dice is a tremendous author. His writing of this book kept me hooked. I just don't know how people can deny this stuff is going on. Scary times, for sure. Thank you, Mark, for putting this all out there for the public to read. Very poorly written and organized. Could have been a fascinating and interesting book. Instead it was boring and bordered on chaotic and scattered. Great read. Fast reading and interesting. You will tear through this book quickly. It will leave you searching key terms on google to check for yourself. Few spelling mistakes but only minor. Great information and good find! Mark Dice has collected some great sources of information. This is one of the better books on the subject. I like is easy read style and his hard hitting facts. I have already purchased his other books to read. Don't miss what he has put together here...It is genuine substance to Investigate on your own. Mark Dice is an expert on secret societies and conspiracies. He is also a media analyst, YouTube personality and best selling author. His YouTube channel has over one million subscribers and his humorous videos expose fake news, main stream media manipulation and "liberal lunatics". His viral videos have been mentioned on several mainstream media outlets around the world and he has been featured o Mark Dice is an expert on secret societies and conspiracies. He is also a media analyst, YouTube personality and best selling author. His YouTube channel has over one million subscribers and his humorous videos expose fake news, main stream media manipulation and "liberal lunatics". His viral videos have been mentioned on several mainstream media outlets around the world and he has been featured on various television shows.